A book by Jean- Sylvestre Bergé and Geneviève Helleringer, Elgar Publishing 2017, just published. Lawyers have to adapt their reasoning to the increasingly global nature of the situations with which they deal. Often, rules formulated in a national, international or European environment have all to be jointly applied to a given case. In a single situation, several laws must be mobilised, alternatively, cumulatively, at the same time or at different moments, in or on one or several spaces or levels, by one or by multiple actors. The book seeks to make explicit the analysis the lawyer engages in every time he is confronted by the operation of several laws in different contexts. The subject matter of the book is not the definition or description of a so-called ‘global law’. The book focuses on the needs of a global lawyer who is required to reach conclusions in a pluralistic context. It makes explicit the required global reasoning. 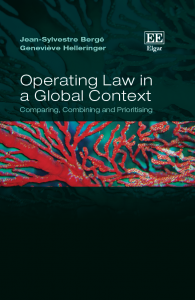 Readers are presented with concrete cases involving more than one legal rule and different levels as well as a modus operandi that the authors found to be invariant in global contexts. Legal reasoning in a global context has to be organised according to a basic three-step approach, consisting of the comparison (Part I), then the combination (Part II) and, finally, the ordering or ‘prioritisation’ (Part III) of the methods and solutions of national, international and European law to be used to solve the case. The book conveys in detail how the law is operated through a wide range of situations and concrete examples cutting across domains, including criminal law, contract law, fundamental rights, internal market, international trade, procedure. The book is aimed at an international audience. Illustrations of how lawyers have to combine different contexts are taken in various domestic case law including the UK, Germany, Belgium, Italy, Spain, the US, as well as France. The book is adapted from an analytical framework that was developed in a book written in French by Jean-Sylvestre Bergé, L’application du droit national, international et européen, Paris: Dalloz, Méthodes du droit, 2013. Academic lawyers as well as practitioners often realise that some cases trigger uncertainty as to the applicable legal reasoning. For example, in cases presented before an international court, lawyers may wonder whether the effects produced by a law applied at a national or European level may be considered. In a European context, lawyers need to be able to determine precisely whether the methods and solutions that have been developed over the last 60 years substitute or add to the legal constructions defined at other levels which came before: national or international. The difficulty facing lawyers increases even more when a case might fall to be decided under a series of different legal environments. Thus, a case presented before a national judge can sometimes give rise to proceedings before a European court, for example, a preliminary ruling on the interpretation or validity of EU law brought before the Court of Justice of the European Union or an application made to the European Court of Human Rights after the exhaustion of all national remedies. More rarely, a national conflict may become an interstate conflict brought before the International Court of Justice. In the same way, a situation addressed by a public or private international court may have consequences for European and/or national courts (for example, a sanction announced by the United Nations and executed at a European and national level or an international arbitral award presented to a national judge who decides to apply European Union law and to consult, in that capacity, the Court of Justice of the European Union). Lawyers may therefore be worried that in spite of all their efforts to put into operation the legal methods and solutions applied in a given context, their analysis could be challenged on the occasion of the re-examination of the case in another national, international or European context. To prevent a new examination from entirely escaping, or weakening, their expertise, what can lawyers (including students training to practice in a global environment) do? Should they open themselves up to other legal environments beyond the one in which they are used to? Or should they revert to the one context that they know best and will therefore provide for a solution with a maximum degree of foreseeability? The book provides a method for tackling these questions. Jean-Sylvestre Bergé is Professor at Lyon University – Fellow of the University Institute of France – France; Geneviève Helleringer is Professor in Essec Business School, Paris – Fellow of the Institute of European and Comparative Law, Oxford – UK.